It’s not every time that one man’s trash is another man’s treasure. Sometimes trash is just trash that needs to be disposed, ideally, properly but this will only happen if and when the right options are there. At the very least, there should be regular garbage collection or a nearby recycling facility. So what if none of these are present. How does one dispose trash? Proper trash disposal continues to be one of the main concerns where we are at right now. We are close to our second month in our new address but so far we only had a visit from the local government’s garbage collector and that was only after we agreed to pay them. The last time we saw the little garbage truck was more than a month ago. We live in a compound with my in-laws and I learned from them that the garbage truck only picks up the trash of gated subdivisions located nearby while residences situated along the way are left on their own. The good news is that I haven’t seen any trash bag on the road sides but I haven’t checked the nearby creek just because I don’t want to. I just know what to expect. 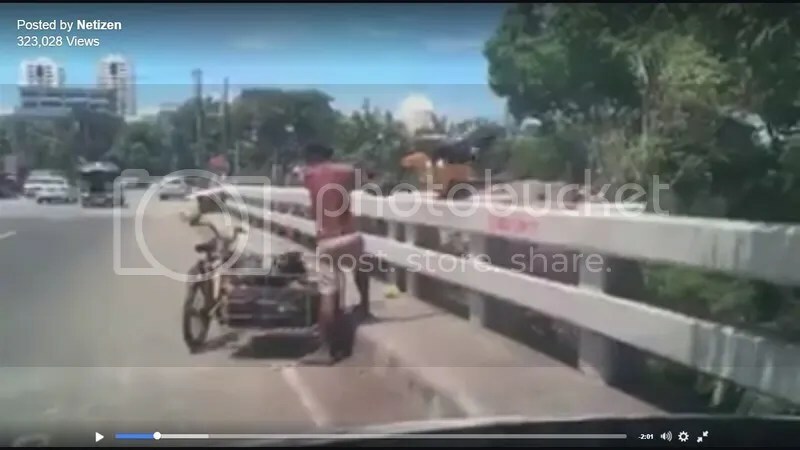 So there was no big surprise when I saw this video on Facebook of a man carelessly throwing garbage bags from a bridge—on broad daylight. It was the sight I hate to see but it was a reaffirmation of what could be happening in most places where people are deprived of proper and regular garbage collection. From what I have heard some families do pay a mangangalakal (individuals who collect recyclable materials) to dispose their trash which usually ends up somewhere but the garbage landfill. I am very particular about how I dispose trash. I make it a habit to sort recyclables and non-recyclables. Back in our old residence, our garbage footprint had been the lowest relative to our neighbors of the same family size. In fact, there would be times when the garbage truck would miss to pick up ours and they would return the next week with the trash bin still not overflowing. Sadly, we cannot and do not have the same control anymore. As much as I hate to I have resorted to another approach. It’s the lesser evil than throwing garbage into the creek but an evil nevertheless. Our son Marcus has asthma condition and very prone to getting sick once exposed to smoke and other airborne irritants so burning trash was never an option but we really have no choice. I already fabricated an incinerator barrel and we have been using it for weeks already. It was effective though I know that this isn’t right and shouldn’t stay long term. I am planning to talk to an officer of the local government to help us but I have been indirectly advised that for now this could be a futile attempt. Politics, I get it but there is hope. I heard that the incoming administration has solid waste management as one of its top priorities. I am crossing my fingers that this will materialize but until then our garbage dilemma remains.